Grand Theft Auto 2 is the direct sequel to the critically acclaimed Grand Theft Auto, and is the only entry of the series to appear on a Sega platform - the Sega Dreamcast. It follows a criminal named Claude Speed walking the streets of "Anywhere, USA", doing missions for various gangs within three maps in order to earn respect. Like the prequel, the game allows you to hijack any car on the map and kill anyone who gets in your way. It was seen to be as controversial as the previous titles as a result. The PC version of Grand Theft Auto 2 was re-released under a freeware license in 2004. 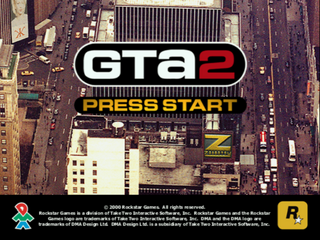 Unlike later entries in the series, Grand Theft Auto 2 was originally designed as a Windows PC game, before being ported to the PlayStation and Dreamcast (and in a simplified form for the Game Boy Color). The most striking difference between the versions is that on the PC, the player can choose whether to play the game at noon or dusk (later GTA games would feature an in-game clock which changes the scenery as time goes on). On the Dreamcast, you can only at dusk, while on the PlayStation, you can only play at noon. Grand Theft Auto games simulate radio stations by having set of a long audio files (sometimes several hours long) which loop indefinitely. Traditionally the radio stations "continue" in the background regardless of whether the player is listening (much like real life), however on the Dreamcast version of GTA 2, no such system is in place. This means whenever the player enters a vehicle, the selected radio station will play from the beginning. The Dreamcast conversion of GTA 2 is the most accurate of the home ports. On the PlayStation, for example, violence is toned down, some optional missions are removed and trains are missing, in addition to expected graphical cutbacks (it is also the only console game in the franchise to receive a "T" rating from the ESRB). Main article: Grand Theft Auto 2/Magazine articles.